The domestic goat (Capra hircus or Capra aegagrus hircus) is a domesticated mammal. It comes from the wild goat. A male goat is called a buck and a castrated goat is called a whether, a female is called a doe. Young goats are called kids. People eat their meat, drink their milk, and use their fur and skin. With goat milk, cheese can be made, along with other dairy products like yogurt. Some farmers use goats to eat plants the farmers do not want, such as weeds. Other times, the goats are used to keep grasses and other plants from getting too tall. This also benefits the goat because they get plenty of food to eat. The domestic goat has cloven hooves, a long beard on its chin, a short tail that turns up, and horns that grow up from the head in an arc. The hair is straight with a woolly coat under it during winter. Goats have rectangular irises. They are one of the few species to have these unique eyes. 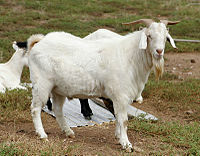 The domestic goat is about 70-120 cm (28-48 inches). They weigh from 45-54 kg (100-120 lb.) during adulthood. The diet of the domestic goat includes eating grass, leaves, shrubs, root vegetables, and other kinds of plants. Some ranchers use goats to clear brush and unwanted plants from their pastures. Goats living in the desert, where plants are quite hard to find, have been seen climbing trees to get food. Domestic goats are smart and active. They enjoy playing with other goats and climbing. They are social animals that live in groups commonly called herds. ↑ "Why Do Goats Have Rectangular Pupils?". curiosity.com. Retrieved 2017-11-02. ↑ "ANIMAL BYTES - Domestic Goat". seaworld.org. Retrieved 19 May 2010. Wikispecies has information on: Capra aegagrus hircus. Wikimedia Commons has media related to Capra aegagrus hircus. This page was last changed on 7 April 2019, at 06:15.